Home / The Archives / Got Spiz? Spiz just sent us some Spiz. I’ve been using it to help me drop some weight. I drink it for breakfast and after my workouts. What’s great about it is the drink not only tastes pretty good, but its complete in nutrition. So that means all my needs are met which also means that I am not having cravings at all. Cool eh! 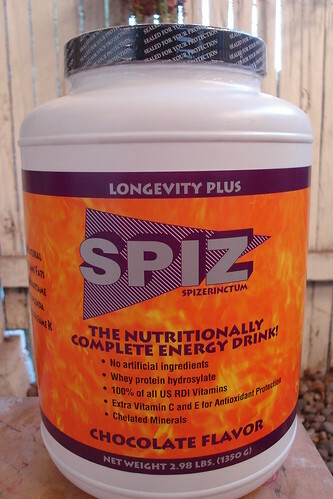 SPIZ is a scientifically blended formulation of carbohydrates, proteins, fatty acids, vitamins and minerals that is mixed with water. It is a complete liquid food source developed to fuel the human engine during times of illness, stress, exercise and/or increased caloric need; a nutritional food and meal replacement drink that is being used by endurance athletes (cyclists, runners, triathletes, etc. ), cancer and AIDS patients as well as geriatric folks trying to maintain or increase lean body mass. The superiority of SPIZ comes from both the correct ratio of ingredients as well as the sources of these ingredients. The following is an explanation of what’s in SPIZ, why and how to use it. It has some pretty serious stuff in it to help your body during and post work outs. For more information about SPIZ, check out their SITE.